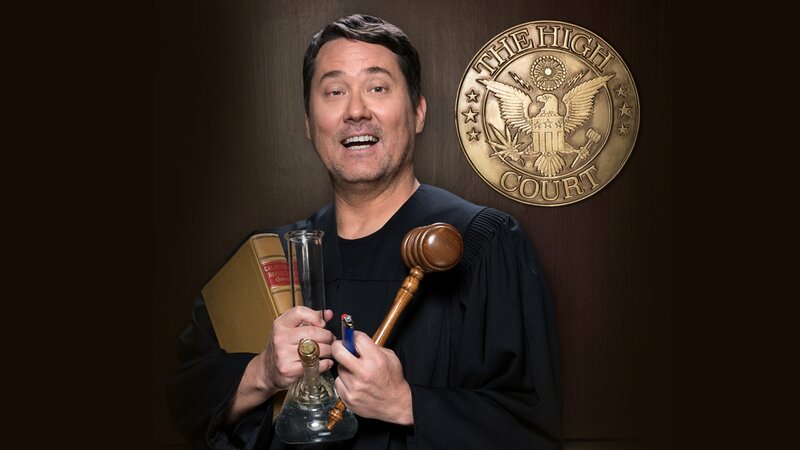 Comic Doug Benson presides over actual courtroom arguments while he's extremely high. Judge Doug settles a heated dispute revolving around a car that got towed. Judge Doug presides over a case involving a mother who claims her daughter owes her money. Judge Doug presides over a family dispute regarding a pet snake; Michael Ian Black. Judge Doug hears a case about comic-on-comic joke-stealing; Jessimae Peluso. A young woman inadvertently breaks her friend's TV when she throws a remote at him in anger. Judge Doug must decide whether an ex-boyfriend is owed money; guest bailiff Reggie Watts. Judge Doug presides over a dispute involving undelivered luxury cars. Judge Doug must rule on a case involving missing hair extensions; guest bailiff Brandon Wardell. Judge Doug hears a case where the plaintiff's mother refuses to pay back rent money. Todd Glass serves as the guest bailiff; Judge Doug hears a case about a lackluster blues singer. The Lucas Brothers help Doug decide a case; a special canine guest stars. Doug settles a case involving two rival magicians; Michael Ian Black serves as guest bailiff. Judge Doug moderates a dispute between a couple fighting over a broken car radio. Doug hears a case between ex-roommates over a disputed security deposit; Tiffany Haddish. A mother sues her son over makeup products; Rory Scovel serves as guest bailiff. 16. Dude, Where's My Truck? Judge Doug hears a case revolving around a missing truck; Joey Coco Diaz guest stars. Judge Doug hears a case involving a non-refundable deposit for a truck that was never delivered. Judge Doug hears a case involving a plaintiff suing his ex-roommate for five months' rent. A man claims that a houseguest damaged his couch while smoking weed. Judge Doug negotiates a dispute between two friends regarding a $3,000 loan; Slink Johnson.